Cool and Circulate Air in Any Room The Air King 9166 is used to circulate air in any room whether in a residential or work setting. The fan fits window openings that are between 27-inches and 38-inches wide and are 26.25"" tall. Traditional window fans are held in place by closing the window down onto the fan. While this is effective, if you ever need to close the window, you have to physically remove the fan from the window. Air King's Storm Guard feature enables the window to be closed behind the fan during inclement weather, or when securing the home. This Air King Window Fan is made of an impact resistant plastic housing, powder coated steel front grill and blade. With a powerful motor, this fan is the perfect cooling solution for instant air circulation and cooling. This fan is compliant with OSHA and ETL. It comes with a 1-year limited warranty to protect against defects in materials and workmanship. Adjustable Settings and Powerful Motor Air King knows that the power house of any fan is a high-quality motor. With this in mind, Air King equipped this model with a 3-speed, 1-phase motor and sleeve bearing, permanent split capacitor. This powerful motor is rated at 120-volts, 1/6-horsepower and has 3-speed settings for cubic feet per minute of 3560, 3120 and 2510 on high, medium and low and rotations per minute of 1600, 1450 and 1100 on high, medium and low. The motor is rated at 1.4, 1.2 and 1.0 amps and170, 145 and 115 watts on highm medium and low. 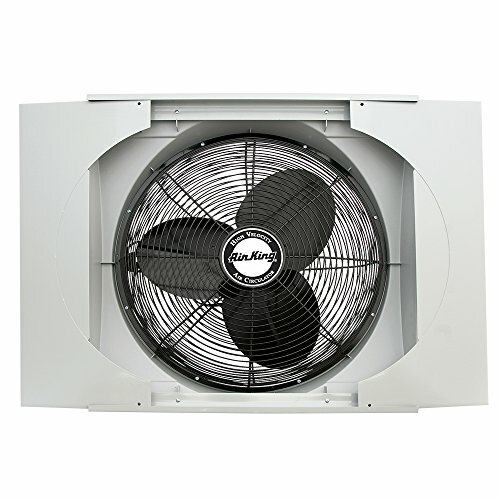 This fan is tested in accordance with AMCA standard 230-99. The industrial grade fan motor means high velocity air circulation with little to no maintenance. Additional Features This fan is perfect for all rooms, large or small. It has a front-mounted rotary control to select desired speed. The power cord is black, 7-foot long, has a 3-conductor, and is a SJT type. Included in the packaging is the assembled fan with Storm Guard sliding panels, instructions, and mounting hardware. About Air King Air King offers a full line of industrial grade and commercial grade air circulating solutions. Whether it's for an industrial setting such as a manufacturing plant, warehouse or factory or a commercial setting such as an office, school or hospital, Air King has the perfect solution for you. Air King is known for its powerful motors that last for years and keep your fan working all day long.